Floyd Mayweather isn't holding any grudges against Conor McGregor because he would like to see his last opponent train with him ahead of UFC 229 in Las Vegas. Conor McGregor has received plenty of offers from people willing to help him get ready to face Khabib Nurmagomedov — now including one from a famous former opponent. 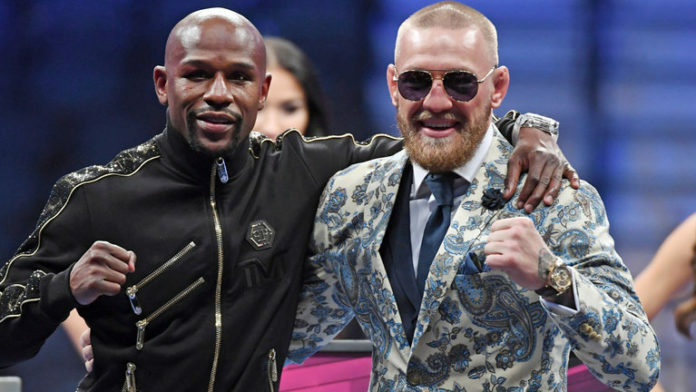 Floyd Mayweather, who faced McGregor last year in a boxing match that ended up as the second biggest pay-per-view of all time, says he would love for the Irishman to come train with him at his gym in Las Vegas. “Leading up to the fight when McGregor gets to Vegas, I know the UFC got a training facility, but we’d like for him to workout at the Mayweather Boxing Club,” Mayweather told TMZ Sports. Mayweather added that he might call UFC president Dana White or even McGregor himself to score some tickets to the highly coveted event in Las Vegas on Oct. 6. While they definitely shared more than a few harsh words towards each other in the build up to their fight, Mayweather gives McGregor credit for showing up and doing his job to the best of his ability when they faced off last year. In fact, Mayweather believes McGregor is going to be a tough out for anybody, including the undefeated Russian he’s facing at UFC 229. Unfortunately, Mayweather has never seen Nurmagomedov fight before so he couldn’t exactly offer McGregor much advice. That said, Mayweather knows what McGregor brings to the table and he believes that’s going to give anybody trouble inside the Octagon. “I don’t really have a prediction cause I’ve never seen the guy that’s facing Conor McGregor but from what I know, he’s a hell of a guy on the ground, hell of a grappler and he can wrestle but the fans want to see you stand up and fight,” Mayweather said. “That’s what the fans like to see. Do you think Conor McGregor should take Floyd Mayweather up on his offer to train together ahead of UFC 229?